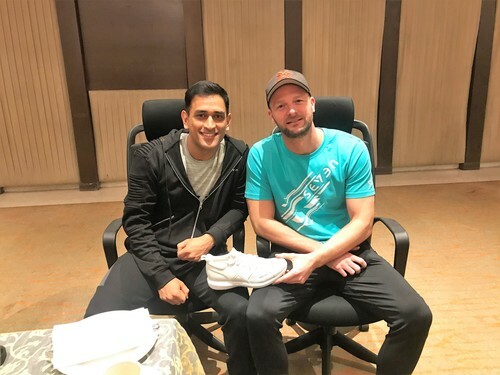 Yorkshire-based business Payntr has entered into a joint venture with SEVEN by MS Dhoni, and together they are expecting it to be worth a minimum of £30million over five years. The fledgling start-up is the brainchild of ex-professional Northamptonshire cricketer David Paynter, as a direct result of his dissatisfaction with the limited range and effectiveness of the cricket shoes available during his playing career. Now this deal with MS Dhoni’s brand Seven will completely transform the brand, catapulting it into the global sports shoe market. SEVEN by MS Dhoni, is an Indian fitness and active lifestyle sportswear brand under the banner of Rhiti Group. Rhiti Group has evolved as India’s fastest growing conglomerate pioneering in sports and entertainment, charted its way to be the leaders of the industry. SEVEN manufactures and markets sportswear footwear, apparel and accessories. SEVEN aims to revolutionize and democratize sports and re-infuse the true spirit of sportsmanship for a healthy lifestyle. SEVEN solely echoes the change-maker attitude of its global brand ambassador, Indian cricketer and the former captain of the Indian National Cricket Team, Mahendra Singh Dhoni who also co-owns the business of SEVEN brand along with Mr. Arun Pandey, CMD and Chairman, Rhiti Group. David spent several years researching sports shoe design, consulting with various experts, then making use of his own unique playing experience he came up with a prototype. After further refinement, the Payntr X Shoe was developed, the first of its kind to combine the power of a cricket spike with the pace and comfort of a running shoe. Now in its newest iteration, the Payntr MK2 will form the basic design of the cricket shoe to be sold throughout the Asian market, and will be branded Payntr by SEVEN. The Payntr cricket shoe has had a very successful first year of trading, and pre-orders from the UK for the new Payntr MK2 are already double the previous year. The shoe, which comes in five distinct colour-ways, is now in shops. When Payntr by SEVEN is introduced into the Asian market later this year, it is planned there will be more than eight variations of colours and trims, including camouflage. Paynter also hinted that there may be further developments in the pipeline, with the possibility of expanding its offering into other sports. David Edward Paynter (born 25 January 1981) is an English-born former cricketer who played as a top-order batsman and part-time spin bowler for Northamptonshire. He played for the Yorkshire academy and the Worcestershire 2nd XI before joining Northamptonshire staff. Payntr is based on the outskirts of Leeds, West Yorkshire. For further information, please contact paynter@rawcreativeltd.com, visit https://www.payntr.com/ or telephone 01423 538 497. This press release was distributed by ResponseSource Press Release Wire on behalf of Raw Creative in the following categories: Leisure & Hobbies, Sport, Business & Finance, for more information visit https://pressreleasewire.responsesource.com/about.